URBANA, Ill. – University of Illinois corn breeder Martin Bohn has received a nearly $500,000 grant from the USDA National Institute of Food and Agriculture to fund research that will improve breeding efficiency. “We are going to use the maize genome with all its intricacies to make breeding faster, more efficient, and more predictive,” says Bohn, an associate professor in the Department of Crop Sciences at U of I. Corn breeding isn’t straightforward, thanks to its particularly diverse and variable genetic material. Bohn compares the sequence of genes on a chromosome to a string of pearls. In most organisms, we expect the pearls in one individual to match up with those in another, in terms of where they are and what information they contain. But that’s not the case with corn. “When we compare two inbred lines of corn, there is often a significant number of genes present in one inbred line but not the other. And some individuals might have just one copy of a particular gene, while other individuals carry multiple copies. It’s all very complex,” Bohn says. 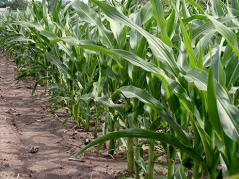 The task of a corn breeder is to find two inbred lines that, when crossed, produce a high-yielding hybrid. As the term “inbred line” suggests, the parents of the hybrids are self-pollinated and fertilized to ensure they have certain desirable traits. But inbreeding leads to problems, including small stature and low yields. When two inbred lines are crossed, the negative effects of inbreeding can be reversed and the resulting hybrids are tall, vigorous, and highly productive. This phenomenon is known as heterosis. “Finding the right combination of inbreds that produce superior hybrids is expensive, time consuming, and is a process that requires a lot of trial and error,” Bohn says. Bohn and his team have been working intensively to understand modern, elite corn hybrids for more than a decade. “We have tested a large number of inbreds and their hybrids for yield, nutritional value, grain-processing characteristics, bioenergy, root complexity, and disease resistance. We looked at a lot of things,” he says. Now that the corn genome has been sequenced, Bohn and his collaborators on the grant – Mark Mikel and Alex Lipka from U of I, and Candice Hirsch from the University of Minnesota – will put corn characteristics data together with genomic information to develop new tools that will add precision in predicting hybrid performance. They will partner with major corn breeding companies to test the performance of their experimental hybrids in 20 locations around the Midwest.